We’re at week 37! Wow! This little girl will be here soon (some people consider 37 weeks full term). I haven’t done a belly picture in a while, and thought I was due one. But wanted something a little different. I guess I’ve never been very good with weekly shots. The last I can find from #2 is at 35 weeks. And, well, I look crazy (but totally in a justified way)! So, here’s my “different” shot. Three beautiful bellies. Mine just slightly bigger than the other two. And, seriously, try to lay down like this with a 5 and 3 year old and not crack up. Because that’s all we were doing. And, I’m going to be bold again. I’m asking for prayers for my low platelets, once again (<–that link explains a lot). I have my weekly appointment Wednesday, and we should know then what type of plan we are looking at. I’m praying that my body does what it’s supposed to do and no plan is necessary, but I have a feeling we’ll have some plan. And, while I know I really don’t want an induction (I’m terrified it would result in a c-section) at this point, it sure is sounding good and would make life easier. But, there is still so much uncertainty there, that I’d rather my body do it on it’s own. 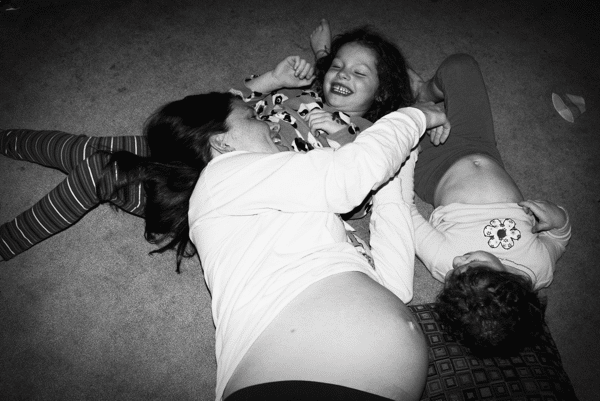 love the bellies and the giggles!! which is i am sure what you will be getting in just a couple of weeks! You look great, Krystyn! Praying for you. Thanks, Andrea! So far, the numbers look good..but they can change any day! So fun! Great pictures! Those girls are just full of smiles. It was hilarious trying to get one where we all looked good. Thank you for adding us to your list! Yes, it did work with N and I know it will this time. I’m *trying* not to think about it, but it sure is hard. So far, the numbers look good. Praying for your good health and safe delivery! Awww..thanks. I think you and the little man should attempt it. It’s just too fun. You look great, and I can’t believe it’s almost time! What fun pictures! Good luck on Wednesday! Thank you! Results were good and numbers were high. Of course, they can change, but the doctor was very supportive with my wait and see approach. Prayers for platelets being sent your way! Much thanks! They are holding steady so far! Thanks, Ryan! It’s definitely feeling like it’s stretched to the max right now. Thanks! It was fun getting all of us looking good. 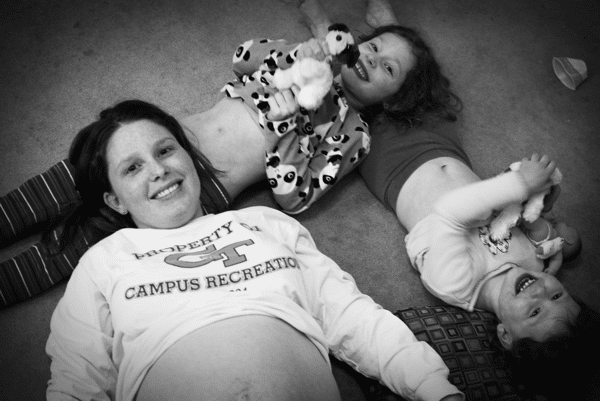 Love this “belly” shot of you girls! I hope you have good luck with your platelets…complicated pregnancies/deliveries are no fun. Sending prayers your way! Thanks, Heather. They called and so far, they look good. Just have to pray they hold steady! It sure was fun taking the picture, too! We laughed a lot. Oh, I love the pictures!! Ya’ll are just beautifully perfect! Definitely keeping you in prayers that all goes well and things move along smooth! You are just too sweet and wonderful…you need to live closer so I can come and visit you when I’m feeling down in the dumps. I love seeing the way you’ve created a real community here on your blog, Krystyn. So, I’m new here, how do I add my pic? Just leave a link? At the bottom of the post, there is a place (linky) to click and add your link. Each week, everybody puts up a new post with a new picture of them with their kid/kiddos. Then, they usually add some words, tell a story, etc. You can see examples of other posts as well by visiting their links (click on the thumbnails). I encourage to you visit others and leave some comment love. Thank you very much for your prayers. They are appreciated! It sure was fun taking it. Thanks. Oh, and they have some super tickly bellies! Love this pic of you & the girls! So cute! So glad to have inspired you! It really does help get pictures of mommy (for me, too), even if it’s one picture Sunday night…I’m still there!